Images used under a Creative Commons license. Click here to view individual source credits. 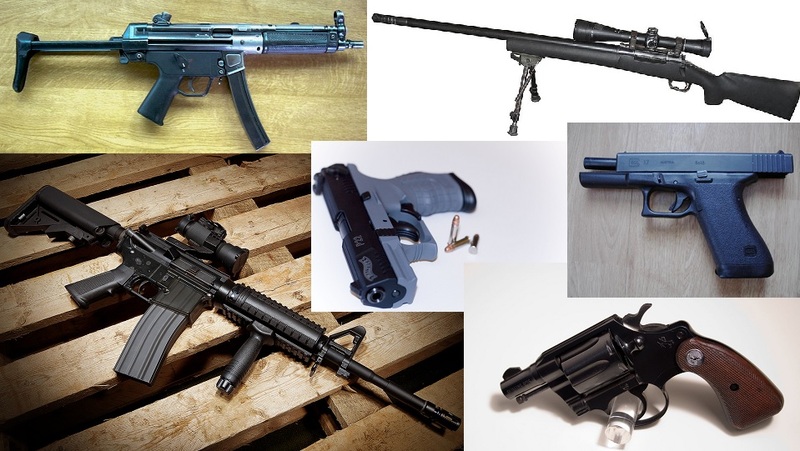 A while back, I had the opportunity to record the mechanical parts on several firearms: a Glock 9mm, Walther P22, H&K MP5, a Smith & Wesson .38 revolver, M4 Carbine, and a M24 Sniper Weapon System. This library is the result. If the weapon had a part that moved (and made sound, of course), it’s in here! Recording was done indoors with 2 cardioid microphones and one shotgun. The cardioids provide a nice close perspective sound with little to no room in the recordings…giving you lots of flexibility in how they can be used. The shotgun mic gives a nice “indoor” perspective without being so characteristic that you’ll have trouble matching it to the space you’re designing for. It gets you part way there, potentially speeding up your workflow for indoor scenes. With over 700 individual sounds, you’ll find plenty in here to play with! Here’s a sampling of what’s included. Check out the metadata sheet to see all of the mechanisms included in the library.